Richard Lawrence became the first known person to attempt to assassinate an American president. Born in England around 1800, he worked as a house painter and it is believed that the fumes from the chemicals sent him mad. By the early 1830s he was out of work and so deranged that he believed that he was King Richard III of England. He also began to dress outrageously and told people that Andrew Jackson, the president of the United States, owed him a great deal of money from land stolen in 1802 and, once Jackson settled the account, he could take his place as Richard IIII. Lawrence also said that Jackson was responsible for the death of his father in 1823, this in spite of the fact that he had never set foot in the USA. Lawrence plotted to kill Jackson; he bought two pistols and began to stalk the president. On 30 January 1835 Jackson was scheduled to attend the funeral of South Carolina congressman Warren Ransom Davis and this presented the perfect opportunity for Lawrence. Intending to shoot Jackson as he entered the service, Lawrence was too far away to get off a shot. Hiding behind a pillar on the east portico, he waited for the end of the service and, as the president walked by, aimed at the president’s retreating back and fired, only for the pistol to misfire. He took out his second weapon but that, too, misfired. 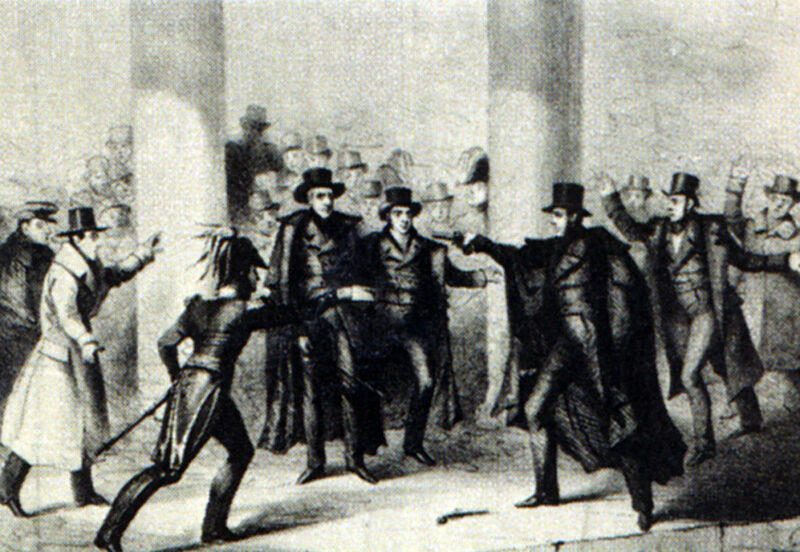 The rest of the congregation including Congressman Davy Crockett, wrestled Lawrence to the ground where, for good measure, Jackson hit him several times with his walking stick although he was prevented from administering too severe a beating. “Let me alone! Let me alone! I know where this came from,” he screamed. The trial of Richard Lawrence opened on 11 April 1835 with the prosecution led by Francis Scott Key, composer of the American national anthem, The Star Spangled Banner. He spoke to the jury, “It is for me, gentlemen, to pass upon you, and not you upon me.” The jury took just five minutes to find Lawrence not guilty by reason of insanity and he was sent to a mental hospital.